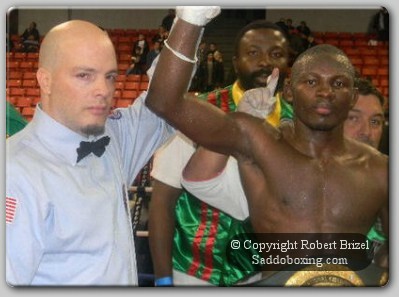 Osumanu Adama of Ghana, now residing in Chicago, pitched a twelve round shutout in the main event last Friday at the UIC Pavilion in Chicago, Illinois, winning every round over Angel 'El Toro' Hernandez to win the vacant IBO International Middleweight title. Adama, showing up at the weigh in the best shape of any fighter currently in the middleweight division today, has turned his career around since signing with Chicago manager Wasfi Tolaymat of the Chicago Fight Club. Adama was an Olympian for Ghana in 2000. Hernandez, a junior middleweight, fought his second consecutive bout at 160 pounds, and while showing stamina, heart, and a granite chin, was unable to overcome Adama's superior height, reach and physical conditioning. Hernandez, now 30-9 (17), was fighting in the wrong weight class. Adama, 18-2 (13), undefeated in Accra, Ghana, like many African fighters, was used out of his weight class in his two previous bouts in the United States, losing questionable decisions to super middleweight Dyan Davis and light heavyweight Donovan George. Like so many African fighters brought to the United States under false promises and pretenses, Adama might have continued to be used and discarded, but was rescued by manager Tolaymat, who saw the fighter's true potential, signed him, and had him trained properly by experienced trainer Joseph Awinongya. Adama kept working a lightning fast jab, followed by overhand right-left combinations to the head, and power lefts to the head followed by rights to the body. Hernandez took extreme punishment while delivering many looping blows of his own. 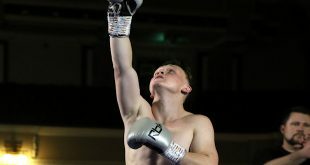 There were some furious exchanges in center ring in the ninth round, with Adama winning the war with his consistent left jab and superior hand speed. Every time the ring was successfully cut off by Angel Hernandez, the fight turned into a brutal war. Hernandez went down in the tenth round, ruled a slip by referee Celestino Ruiz. The tenth, eleventh, and twelfth rounds were all the same story, Adama landing left jabs and Hernandez swiping less than most of them away. 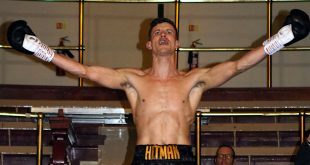 While a dangerous veteran able to take a punch, Hernandez needs to return to 154 pounds where he can be most effective. Hernandez has the heart of a warrior, and would be better compensated fighting opponents more his size or to his stature. 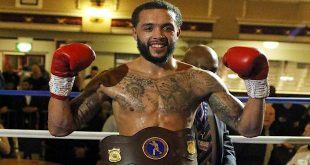 Chicago's 'King' David Estrada scored a fifth round technical knockout over Franklin Gonzalez of the Dominican Republic in a junior middleweight match. Gonzalez ate his way up to barely get to 152 into the higher weight class from his usual welterweight division. Estrada weighed in at 152 pounds, 4 pounds over the agreed weight of 150, and took a $1000 penalty. Southpaw Gonzalez won the first four rounds by foot positioning and determination, while effectively using his right hand jab and his straight left hand. He positioned his right foot on the outside of Estrada's stance and stalked him until the fifth round. Very early in the fifth round, Estrada placed his left foot on the outside of the southpaw's right foot, and landing a straight right hand lead that put the Dominican fighter on the canvas for the first time. Gonzalez beat the count, only to face the fury of Estrada's onslaught of straight right hand leads, causing the Dominican fighter to hit the canvas for a second time. 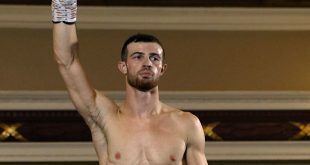 Although Gonzalez beat the count, the referee saw something in his eyes and determined he could not continue, and waved the bout to a halt at 1:05 of round five. 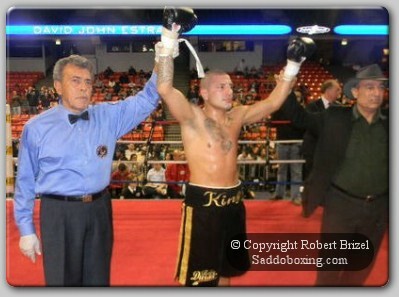 Estrada, now 25-6 (16), will return to 146 pounds in his next bout in February 2011. Gonzalez, also a welterweight, fell to 13-7 (9).